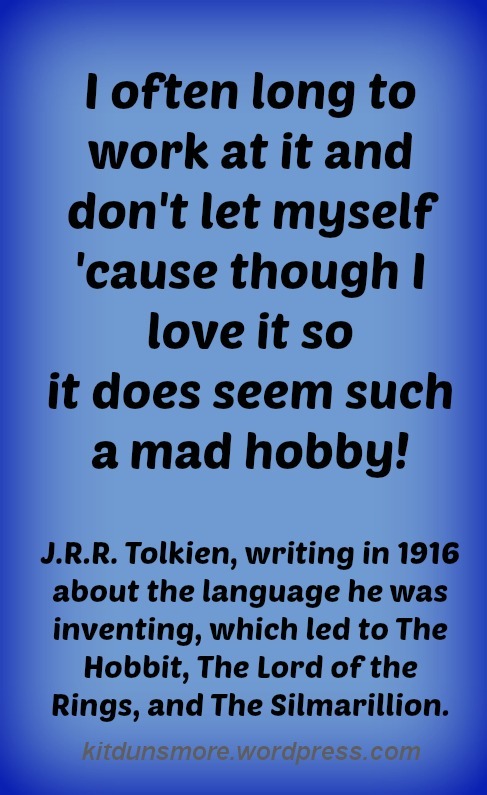 I love this Tolkien quote. In one sentence he offers both comfort and hope. I get comfort from the fact that like me, he sometimes struggled to let himself do the things he enjoyed. I also suffer from creative anorexia, holding back from things I know I will enjoy because they seem frivolous. My “mad” hobbies include writing, quilting, drawing, painting, book-binding, spinning, and knitting. I love them all, but often wonder if it’s wise to spend my time on seemingly pointless activities when there are so many things that need doing. I also find hope in Tolkien’s story. Why pursue your mad hobbies? Because there’s no way to know where they might lead. In Tolkien’s case, the languages he created were the basis of his books, and led to a fantasy world so rich and vivid that they live on today, loved by a multitude of devoted fans, even though their creator is gone. Tolkien was born 122 years ago today. I am grateful that he took time for his mad hobby, that he let himself waste time on things he loved, because it means I get to read the wonderful books that evolved from his play time. And I’m glad to find out that for some at least, frivolous pursuits can have magnificent results. It gives me hope that my pointless loves may prove valuable in the end, if only to me.